UPDATE: 2018 with new emergency checklist graphics. When the Twin Towers tumbled on this day 17 years ago, I watched the TV in horror with my cats on my lap. I’d moved a few weeks earlier from Canada to a safe and leafy suburb 20 miles north of Manhattan. My concept of safety changed that day forever. Many pets perished when owners who lived in the evacuated area in lower Manhattan were forbidden to enter the zone. I dedicate this post to all the pets who died on and in the aftermath of 9/11. There is nothing anyone could do to prepare for that level of catastrophe but there is plenty we can do for other emergencies. The likelihood of us experiencing a nuclear threat or terrorist attack is tiny. More likely are natural disasters. Most geographic areas have an increased risk of certain natural disasters i.e. hurricanes, earthquakes, tornadoes or flooding. Everyone who lives in an earthquake zone or place like “tornado alley” must familiarize with their specific risks. Then there a flukes of nature creating the unexpected like Super Storm Sandy. In my home, we were prepared with everything including a generator but nothing could prepare us for a sudden blast of hurricane force winds breaking open a window, leaving broken glass and debris in its wake. Thankfully our cats were in another room. Emergencies aren’t always on a giant scale. They can be small like a temporary power outage, a basement flooding, a cooking fire, a burglary, a broken window, a sudden illness, a family emergency necessitating travel or any other sudden change in the household. You may or may not be there when an emergency strikes but chances are your pets will be home. September is National Preparedness Month. If you don’t already have a pet emergency plan, take a few minutes to make one from the info in this post. If you have kids, get the whole family involved. Make it a fun weekend project. No one thinks clearly in a panic. Prior to a recent vet visit my husband was tore up and down the stairs looking for a certain cat carrier. He forgot he’d moved it to another closet without telling me. With an updated written plan, we’d have known the location. 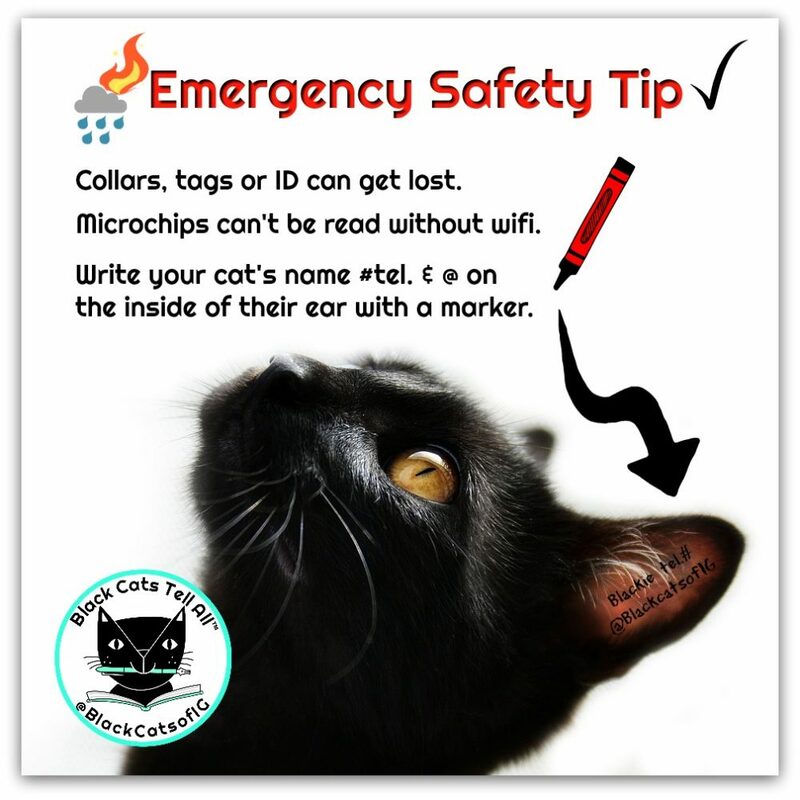 Our latest tip is the easiest way to create an ID if you’re cat is not micro-chipped and does not or cannot wear a collar. ID: All pets should be micro-chipped and their information updated yearly. Have collars with tags (regular or tags with id with QR.) Have leashes and harnesses for each pet. If pets don’t usually wear collars or harnesses store in an emergency storage container). A written plan can be hand written or printed out from the computer. Use a marker to mark each item on the checklist after you complete each item on the list. Review or update the list yearly. Keep a copy online and a hard copy in a protective plastic cover. Store inside your emergency kit container. n easy to access location. To save space there are folding/stackable containers. We also store ours along with 10 gallon bottle of water and other supplies in our mudroom. If your have multiple pets or large dogs, you may require more than one emergency container. Pet emergency kit items: First- aid kit specifically for pets (store bought or assemble your own) towels, foil/space blanket, familiar toys, litter, scoop and small litter box, food in watertight containers, can opener, bottled water, unbreakable food and water bowls, all meds and prescriptions, copies of vet records and/or proof of ownership, natural stress remedies like Rescue Remedy, Spirit Essence’s “Storm Soother” or Feliway Comfort Zone spray, small plastic garbage bags for used litter and garbage, paper towels, plastic tarp, large plastic garbage bags, flashlight, extra batteries in sealed plastic bag. If you don’t want to store items with expiry dates like meds, Keep them separate and note them on your PLAN. In case you lose cell phone contact, keep a hard copy of important info with a waterproof cover or ziploc bag including: vet contact info including emergency vets, animal control agencies like HSUS, ASPCA in your area and/or destination area. Keep carriers, one carrier per pet with bedding near the emergency container or other easy to access location. Tape your pet’s photo with contact info inside the carrier. Do a home hidey-hole test. Inspect every inch of your home for possible inaccessible spaces for pets to hide. In an emergency, a stressed animal will hide. Block, stuff or protect inaccessible locations in advance. Make or purchase a “Rescue Me” and “Evacuated” signs to place on your front door in the event you have evacuated the premises. You are welcome to print out the ours and add your number of cats. Make an exit plan in advance. Find out in which motels or hotel in your area accept pets. TripsWithPets.com has quick info for the U.S. and Canada. Keep a list of pet sitters, boarding facilities, friends or neighbors who can care for your pet if you’re not there. Emergencies can happen in the home while you’re out. Make sure a pet sitter or someone you trust has a key/security codes to your home. Listen to the radio for weather reports. You can’t rely on social media if there is no Internet service. A battery or crank-operated radio works well and there are ones with built-in cell phone chargers and flashlights. If given orders to evacuate your home do not leave your pet. Don’t wait until the condition are more extreme. If you have no choice, leave “Pets Inside” stickers or notes on doors and windows with contact info. 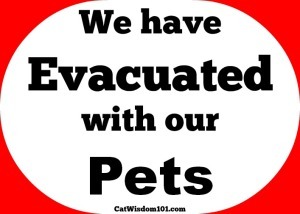 If you have evacuated with your pets, leave a note on the door saying “Evacuated with pets”. Have a buddy plan with your neighbors to check up on each other. If staying put, keep all pets (with their carriers and supplies) in one room or part of the house where the doors and windows are secured. Remove any sharp, toxic or dangerous items from the room. Keep your vehicle serviced and gassed up. If you are taking public transportation or other means, place as many needed items possible in a large wheeled suitcase with the pet carrier on top. Bungee cords are handy for securing. Place an article of clothing like a worn T-shirt that smells of you inside the pet carrier. 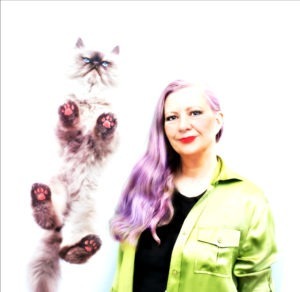 The familiar scent will bring comfort to your pet especially if you are separated from them. Above all, stay calm and be prepared. Humans and animals have survived every kind of disaster for millennium and always will. What are your memories of 9/11? Do you have an emergency tip to add? Stay safe everyone during this hurricane season and beyond. We’re donating proceeds from our book sales to hurricane relief. Thanks for reminding us once again about how important preparedness truly is. Excellent post. I really need to get prepared. With 13 cats, I don’t know what we would do. We know mum will always remember September 11,2001. 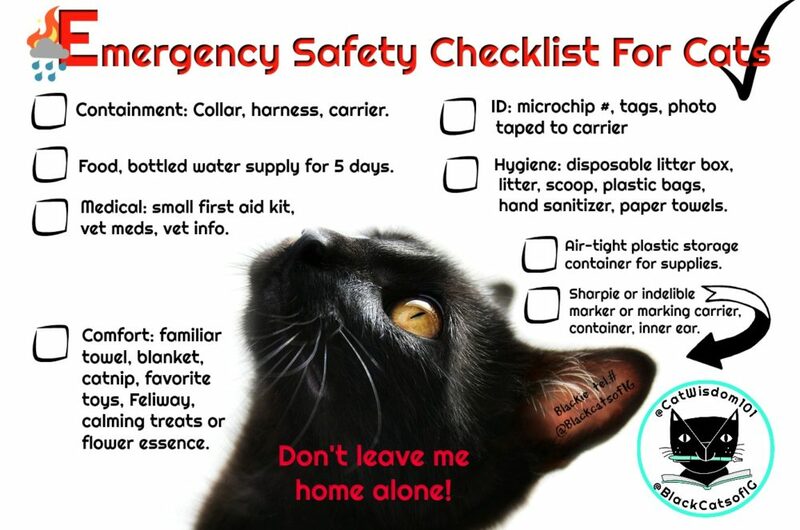 We really like this pet preparedness list. 17 years….it seems like yesterday. We remember all who perished for any reason associated with this event, so needless, so wrong. Thank you for the reminers for emergency preparedness!!!! We send out love and prayers and purrs to all that are enduring traumatic events and disasters any where in the world past ,present or future. Very important info. TW dreads to think of any emergency here since they don’t have a car and it would be next to impossible to evacuate with me and the many days of supplies needed. Where would they go? 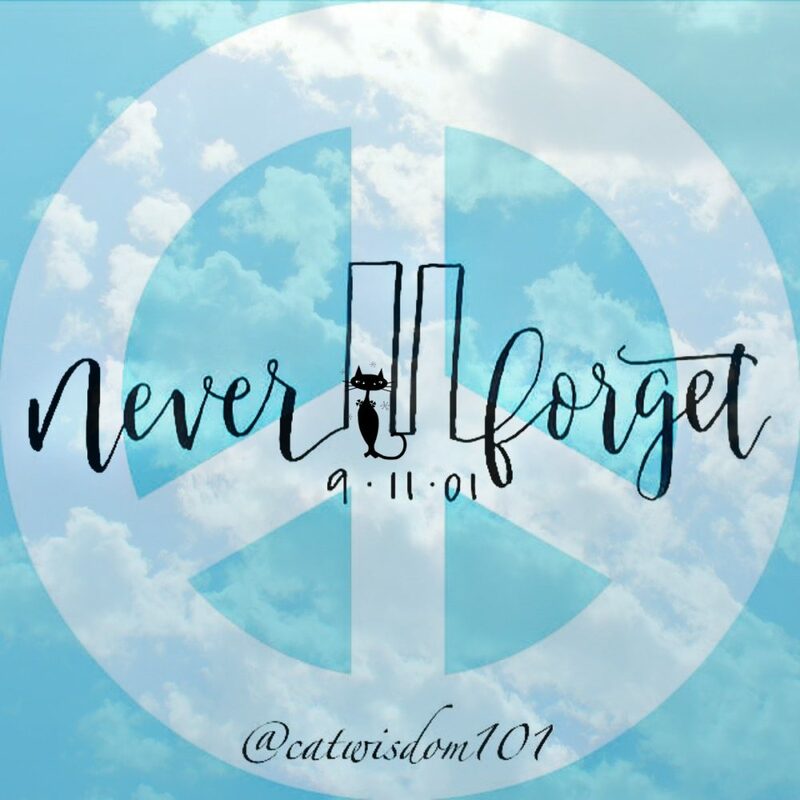 Every year we share our 9.11 memories on our blog. It’s long but no apologies. Pop got accepted into the 9.11 Health Program this year. Feel blessed that you were watching on tv and not in person. we currently work to find a solution for emergency cases… it is more difficult now with two dogs… but we will find a way. We will never forget that day, or how we were irrevocably changed. Thank you for remembering, and for reminding us all about being prepared. A great post, pets are family and you can never be too prepared! We will always remember and we hope everyone does. Great emergency info! This is an important subject with lots of very sound ideas. All great ideas. I’m glad you posted about the storage box on wheels cos TW has been wondering about how she was going to carry all the emergency supplies we’d need. Unfortunately, we don’t have room or enough closets in this condo to keep large storage items. My PTU was taken out of the furnace room and put in full view after there was the small fire on our floor. As far as 9/11, since the bridges and tunnels were closed, TW called a close friend who had their key to feed Nicky and Autumn. Later Pop did make it home by boat and he fed them again. HAH! The pets lost in lower Manhattan is something that upsets the head peep a lot. When she read Homer’s Odyssey back when it was originally published, that was the hardest part of the book for her to get through. We like the idea of an “evacuated with pets” sign. We’ll add it to our hurricane kit! Everyone who evacuates should take their pets. We know that our human family won’t evacuate without us, no way. Great post and good info to know. Thank you Layla!!! This is the best information!!! You can never be completley prepared for everything but the more you prepare the better. I would also suggest a practice drill at least once a year. The short term stress on the “kids” is worth it in the end because it becomes a memorized routine and you are far less likely to panic in the event of a real disaster/ emergency. We will remember with a prayer and a purr all those that perished, tonight when my gang is together. Thank-you. I like that idea. Gweat posty. and fanks fur puttin’ up da shawe buttons on top. Weez wuz able to shawe wiffout gwantin’ all kinds of purrmissions. Being in a Hurricane prone state I have two choices stay put or leave with the kitties. I would never leave them behind. No matter what we’re in this together. kids & catz will hide N adults N dawgs will run…it bee a natural instinct…de food gurls dad iza ree tired fire fighter N can tell ya thiz furst hand. Good information for all of us. Stay safe everyone! Thanks for a great and very important post. We have a sign on our door too. And our local firefighters are informed in which house live pets. This is an excellent list of things to do, things to be prepared for, how to handle emergencies of all kinds…….it still breaks our heart that so much life was lost on 9/11 – human and animal alike. 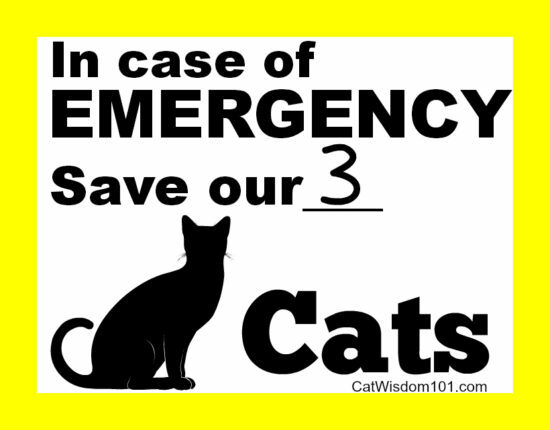 This is really important – humans who live with kitties can never be too prepared!